The VW R32 is a 3.2-liter VR6 naturally aspirated gasoline engine well known by VW Golf R32 mk4/5 model application. In addition, the engine was used on other Volkswagen models as well as Audi. The R32 engine is a member of the Volkswagen’s EA390 family. The 3.2 VR6 has a grey cast iron cylinder block with narrow 15 degrees angle between cylinders banks. The cylinders are moved by 12.5 mm from the center of the die-forged steel crankshaft. In this case, there is a 120 degrees firing interval between each cylinder. The crankshaft has seven main bearings. Due to the narrow V-angle, the need for separate cylinder heads for each cylinder bank was gone. The R32 has a single aluminum alloy head and double overhead camshafts (DOHC). The engine has a timing chain (simplex roller chain). The engine has four valves per cylinder, 24 valves total. Each camshaft has 12 cam lobes, so the front camshaft actuates the all intake valves, the rear camshafts – the exhaust valves. The valvetrain is equipped with low-friction roller finger cam followers with automatic hydraulic valve clearance adjustments. The 3.2L VR6 engine has variable valve timing (continuous timing adjustment) for both camshafts (52 degrees on the intake at the front, 22 degrees on the rear exhaust camshaft). The engine has an electronically controlled variable intake manifold; it is a twin-path intake manifold. This engine has a traditional sequential multi-point fuel injection. The six injectors are mounted on the intake manifold ports and normally hidden behind the top part of the intake manifold. There are two cast iron exhaust manifolds from the back side of the engine. The 3.2 VR6 engine equipped with an electronic ignition system with six individual single spark coils for each cylinder. The engine also has an electronic drive by wire throttle body. The engine operation is controlled by electronic engine control unite (ECU) Bosch Motronic ME 7.1.1. The list of common problems is not so big for the R32 engine. The main issue is a serpentine belt tensioner fail - it's an Achilles heel. Also some reports about a coil pack failure resulting in engine stuttering. The engine provokes to drive hard and people use cars with R32 engines for track days as usual. Under high loads, high revs and etc. the flywheel bolts easily break or unscrew by itself. As you might guess, the fuel consumption is not the best side of the engine. 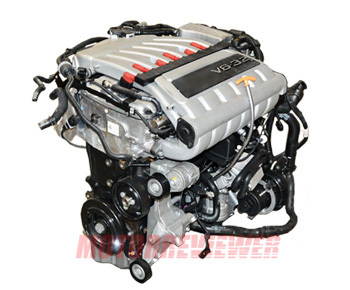 But, the 3.2 VR6 engine mostly is a trouble-free power unit and it’s very reliable. The engine longevity is well over 150,000 miles (250,000 km). The operation is very smooth and the sound of the R32 engine is great. 173 kW (235 hp) at 6,200 rpm, 232 ft lb (315Nm) at 2,950 rpm. This is engine for the Volkswagen Transporter T5. BFH - 177 kW (241 hp) at 6,200 rpm, 236 ft lb (320Nm) at 2,500-3,200 rpm. Application: VW Golf Mk4 R32 for the US market. BML - 177 kW (241 hp) at 6,250 rpm, 236 ft lb (320Nm) at 2,800-3,200 rpm. Application: Australian VW Golf Mk4 R32 engine. BDB, BHE, BMJ, BPF, BUB - 184 kW (250 hp) at 6,250 rpm, 236 ft lb (320Nm) at 2,500-3,000 rpm. This engine has a lower compression ratio 10.85:1 and different intake manifold. Application: Audi A3, Audi TT, VW Golf Mk5 R32.